Delhi Subordinate Service Selection Board Teacher Result, Marks List & Cut-off Marks - Check here DSSSB Teacher Latest Result of Post Graduate Teacher, Trained Graduate Teacher (TGT), Primary Teacher (PRT) and other teaching posts (Assistant Teacher Primary, Domestic Science Teacher, Special Educator, Special Education Teacher, Physical Education Teacher, Music Teacher etc.). The Board has released written test result, marks list, cut-off marks and final result for many posts and subjects on the official website i.e. www.dsssb.delhigovt.nic.in or www.dsssnonline.nic.in. The candidates who have appeared Tier-One Exam 2018-19 for any post or subject like PRT, TGT & PGT Hindi, English, Mathematics, History, Geography, Commerce, Economics, Political Science, Physics, Chemistry etc. can check here latest updates on Delhi Teacher Result, Cut off Mark List. Check Delhi SSSB PRT, TGT, PGT Latest Result, Cut-off Marks, List of Selected Candidates, Marks List and Final Result 2019. The board had conducted written and online examinations in 2018 for various teaching posts. The written test result, e-Dossier schedule, marks list, cut off marks and list of shortlisted and selected candidate along with final result of various posts/subjects of PGT, TGT and Primary Teacher have been declared by DSSSB. The latest and detailed result notices are available here to check through official website of DSSSB. The result and cut-off marks list can be checked here post-wise and subject-wise. DSSSB Latest Result 2019 (16 April) : Final Result of PRT (16/17), PGT Physical Education (94/17) & TGT Urdu (146/17) has been declared on 16.04.2019. The Written Test & Final Result Marks List of PRT (16/17), TGT Sanskrit (145/17) & PGT Sociology (129/17), TGT English, TGT Hindi, TGT Natural Science, Drawing Teacher, PGT Political Science & PGT Home Science, Assistant Teacher Nursery (88/17), PGT Physical Education (94/17 & 95/17), TGT Social Science (137/17) and Physical Education Teacher (90/17) was declared earlier. DSSSB PRT Result 2019 Cut-off Marks List - Check Delhi Primary Teacher Result and Cut-off Marks List 2019. PRT Written Test was held on 30 September, 2018 & 13, 14 & 28 October, 2018 for post code 01/18 and 16/17. The written test result, marks list, cut off marks and e-Dossier schedule can be checked here as and when they are declared on the official website. 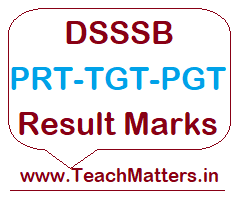 DSSSB TGT Result 2019 Cut-off Marks List - Check Delhi Trained Graduate Teacher Result and Cut-off Marks List 2019. TGT Written Test was held from August 2018 to November 2018 for post code 131/17 to 147/17. The written test result, marks list, cut off marks and e-Dossier schedule can be checked here as and when they are declared on the official website. DSSSB PGT Result 2019 Cut-off Marks List - Check Delhi Post Graduate Teacher Result and Cut-off Marks List 2019. PGT Written Test was held from July 2018 to September 2018 for post code 93/17 to 130/17 and 150/17 to 151/17. The written test result, marks list, cut off marks and e-Dossier schedule can be checked here as and when they are declared on the official website. This blog is a very useful one for all the people who aspire for government jobs. Timely updates regarding the date of application, commencement of exams and publication of results are available here. So there are no chances for the candidates to miss any exams. Previous year questions provided help the candidates in their exam preparation. Please keep your blog updated with latest data. Visit apply new pan card for clearing any pan card related queries.